How long will it take the goods to reach Bangladesh? Depends on the city of loading. We will try our best to make it as quick as possible. Where can KB Global pick up my goods from? We can send a truck to your factory as desired. You can also send it to our godown in Bhiwandi. How long in advance do I have to inform KB Global for loading of goods? 1 day in advance (3 days will be preferred). 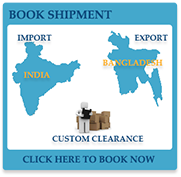 Is kbglobalcarriers.com a safe site to book shipments online? Yes, we are committed to protecting our customer's information. Our staff of security technology professionals uses a range of the best security technology available. Your information is secured from unauthorised access from the Internet using the Thawte Certification Authority. We protect the connection between your computer and our server from eavesdropping through industry-standard encryption technology. What are the terms and conditions that will apply to all bookings? All transactions undertaken on www.kbglobalcarriers.com and over the phone with our agents are subject to our Terms & Conditions. Please review these carefully prior to booking shipments.